Caria, Knidos (Cnidus). Circa 6th-5th Century BC. Obverse: Head of roaring lion right. Reverse: Archaic head of Aphrodite right within incuse square. References: BMC –, Sear 1750 ff (except in AE) Very Rare. Size: 17mm, 4.50g. 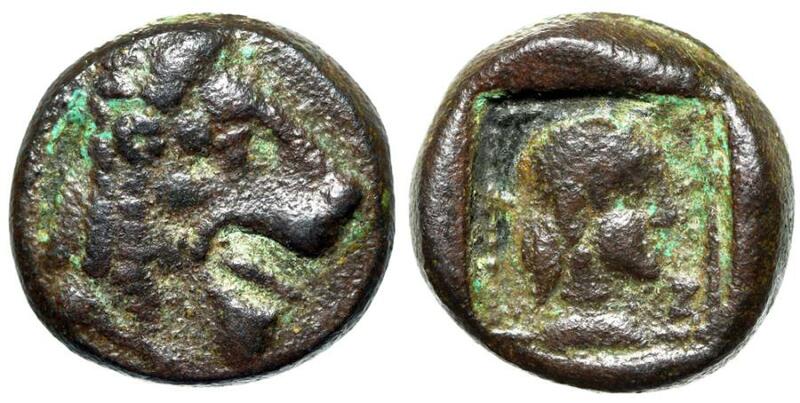 Numismatic Notes: A very rare AE denomination of Knidos! This type mimics the design of the contemporary drachms, but was struck as an AE denomination seemingly with its own dies!